SYNOPSIS: Alex, a tattoo artist in Queens, NY, is being driven out of business by Johnny Needles, a rival tattoo artist connected to the local gangs and biker clubs. As he falls further into depression and drug abuse, Alex is drawn to a nameless book he saw at his neighbor’s apartment. The book haunts his dreams, until he can’t resist and he finally steals it. At his lowest point, in the basement of the tattoo parlor, Alex uses the book to call forth the Car Nex demon. He is completely unaware of what he is about to unleash upon the neighborhood. 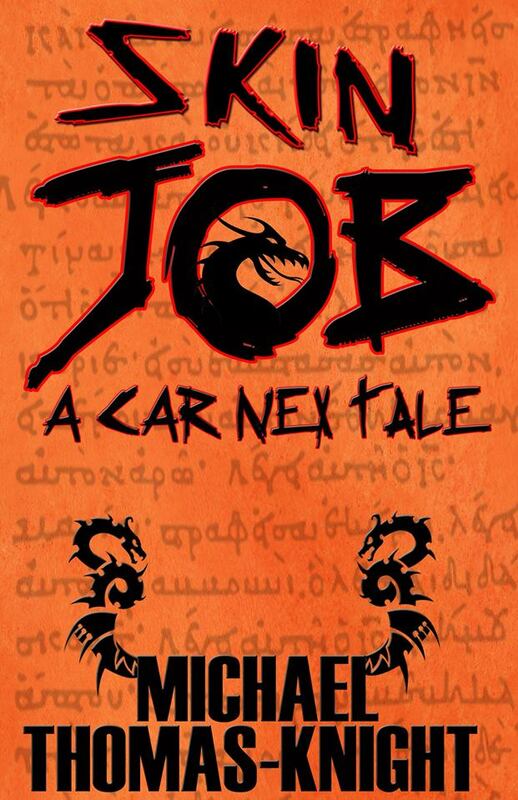 Folks, recently I had Mike over at Parlor of Horror drop me a mail asking if I would be interested in reading his novella, Car Nex: Skin Job. I was so pleased to have been asked by a fellow blogger to check out their work and let them know what I felt that I, of course, immediately agreed to it. I was interested. Plus saying it was a dash of Breaking Bad meets Lovecraftian horror? Hells YES I was sold! Anyway, Car Nex: Skin Job is a really quick read (so nobody here has an excuse not to support Mike by heading on over to Amazon and purchasing a copy 😉 ) and it is entertaining from the off. I must admit that there weren’t an abundance of nice characters (aside from Mrs Sing, the cool Chinese-but-actually-Korean restaurant owner), but that does not detract. A novella doesn’t really have time to build these in depth and crazy characters. This read was no exception – the story gets into the thick of things, and it does so fast. It does not pussyfoot around trying to think about what it wants to be, no sirree. It just gets right in there. Down in the dumps and a frequent drug dealer, Alex is losing everything in life, and when his rival/nemesis opens up shop three stores down, you know that it is just the last straw. I really enjoy a crazy, supernatural/monster horror, I do. I am so tired of reading these crappy reviews on horror novels where people complain that the novel “expected them to suspend too much belief”. It’s a supernatural/monster horror people, it isn’t supposed to be the most believable. Car Nex: Skin Job totally delivers on that front, and does not pretend to be anything other than what it was. There were quite a few moments where the writing and the scene construction felt like something out of a movie, which was really cool. Anyway, I would highly recommend checking out Car Nex: Skin Job – $0.99 and a half hour of your time? Come on, totally worth it, especially if you enjoy crazy supernatural/monster horror! This entry was posted in Books and tagged book reviews, books, good read, horror, Supernatural. Bookmark the permalink. Very nice to see such good support. And I’m sold, I’ll check this out. Yay! That’s awesome to hear Tom! Definitely a crazy and fun one! Hope you enjoy it! Thanks so Much ZOE, you’re my first blogger review!!! My utmost pleasure Mike! Thank YOU for allowing me to read and review it for you!